Today’s storage devices operate in the micro-second range, fast transitioning to sub-microsecond memory class and must support a broader range of application workloads and storage capacity ranges. Furthermore, workloads are unstructured and are no longer simply random or streaming oriented and modern storage systems must adapt in real time. SDV enabled systems utilize an ultra-low latency block translation layer, with sub-microsecond overhead latencies. Using a translation layer provides a more deterministic approach to virtualization and provides the best approach to achieving the native performance of the underlying media mapped to the application workload. Enmotus SDV products provide a fully automated load balancing storage solution that uses a mix of different storage performance, capacity and cost points and is capable of providing flash and memory class performance without the need to move to an expensive all-flash or all-memory class solution. By analyzing local traffic patterns, SDV systems are able to relocate the appropriate media within virtual disks to match the IO performance characteristics. This movement is fully automated but can also be influenced by user programmable policies to help tune to specific application needs. In the case of very large scale deployments of data servers, it is a fact of life that storage devices will misbehave, wear out and ultimately fail. It is not practical in these cases to rely on passive monitoring to detect and handle such misbehaving devices. Early detection and automated handling is becoming an absolute necessity for data centers at all levels. 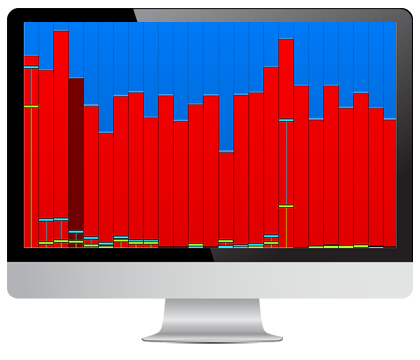 Enmotus SDV products support dynamic real time remapping of storage devices to match application workloads, and is also developing device behavioral analysis technology that can automatically detect performance outliers and take action before they become a more serious issue. Using a number of different device telemetry sources, local machine learning SDV enabled storage nodes can dramatically improve quality of service and system efficiency. With SSDV’s ability to present device telemetry data via JSON/RESTful from each node in the system, data center architects can now implement centralized storage intelligence servers for collecting system wide device telemetry data. This additional insight provides invaluable data on how local storage node devices are behaving. Much of this data is invisible to most software defined storage layers and provides a new way to identify system wide trends and storage device behavior patterns. As the industry continues to offer new forms of storage devices based on solid state technology, it is important to create the right environment that can withstand change at device level without impacting applications and/or causing system downtime. This is further enabled by evolving fabric storage standards such as NVMe over fabric which is an ideal complement to SDV. 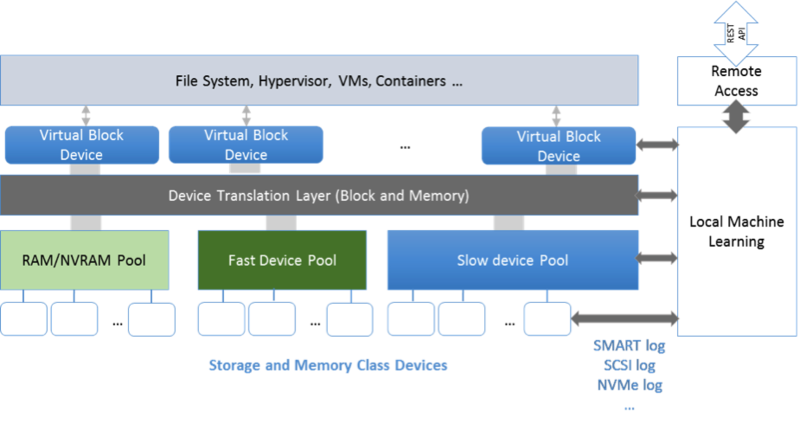 SDV enables early adoption of memory class devices by presenting them today as a virtual block device that is understood by all of today’s applications. As memory aware applications become prevalent, SDV will provide an easy transition that will allow physical devices to be represented as either virtual block or memory. Enmotus SDV products greatly ease transitions to and from new storage devices ensuring that applications always see a uniform interface and management methodology.